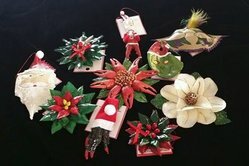 Cajun Christmas Ornament,Holiday Cajun Gifts,Ornaments made by Cajuns! Free shipping on all orders! Welcome to Cajun Ornaments and Gifts made from Real Alligators,Crawfish,Crabs,Garfish,Oysters,Redfish Made in Louisiana all orders go thru PayPal Free ornament with any order!